Advanced Staging provided support at the last minute for Colombia's controversial visit of Iran's president, Mahmoud Amandinijad.With only two days notice, Advanced Staging created a closed circuit system at Columbia University for broadcasting the much-publicized September 24 visit of Iran's president, Mahmoud Amandinijad. Advanced received the call Friday, pulled the gear and coordinated the details on Saturday, and was in the College Walk Courtyard on Sunday to set up a large 13 x 17 foot LED video wall with the appropriate sound system for the overflow crowd of up to 20,000 people. 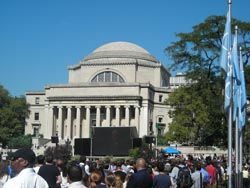 "Columbia University has relied on us to provide audio, video, and lighting services for other major events with challenging venues, so when this call came through, the Advanced team was pleased to be able to turn on a dime and deliver what was needed to create a successful broadcast event," said Steve Wildemann, president, Advanced Staging Productions.